Batman's next console outing will be much darker than his first according to the Dark Knight's voice actor, and will see the return of a much loved villain. Kevin Conroy, who has lent his voice to the Dark Knight in a variety of projects, has confirmed to things about the upcoming sequel to last year's Arkham Asylum: Firstly, that it will be much darker in tone than its predecessor and it will feature Two-Face as a villain. Speaking at the C2E2 comic convention in Chicago, Conroy was reportedly tricked into revealing the inclusion of Two-Face in the game, and then tried to recover from the slip by saying "There's a very complicated cast. A lot of villains are in it. I'll just leave it at that!" 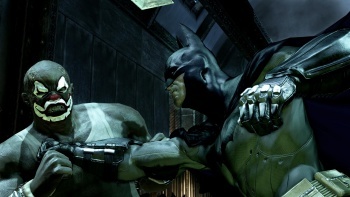 Conroy also said that the game would go to a dark place, comparing it to 2000's Batman Beyond: Return of the Joker, a major plot point of which revolved around the Joker torturing Robin. "It involves a lot of the villains and it goes to that area," he said. "It's that dark."